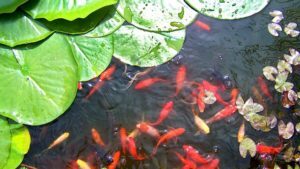 Remove dead leaves from pond plants and move hardy plants such as lilies towards the deepest part of the pond to prevent their tubers being frozen. Fish slow down as the temperatures drop. Start feeding them easy to digest foods at the start of winter. When temperature drops below 100C (50F) stop feeding them, as they don’t digest food. Plants that would normally remove waste are also in a dormant state so increased level of fish faeces would affect the water quality due to ammonia and nitrates leaving them to build-up. Koi don’t have stomachs so what they eat and their bodies don’t need will only be excreted. What they eat is for the purpose of growth, colour and energy. Koi are cold-blooded so metabolism is dependent on water temperature. Keep pond from freezing over for any length of time. If you leave it to remain frozen over gases will build-up, oxygen levels will drop and affect survival rate of your fish. As the water warms fish start to swim to the surface looking for food. At temperatures between 5°C and 10°C fish can be fed low protein foods, such as wheatgerm. Above 10°C they can be fed general fish pellets. Keep algae under control. Rake away long filamentous algae from the water surface.